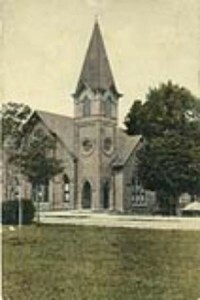 1878 - First Baptist was organized as a church on November 3, with a small sanctuary completed in 1880 on Hampton Street. 1894 - The sanctuary shown in this photograph (at right) was constructed on the same location as the first sanctuary for $4,500. 1918 - In January the church purchased a lot at the corner of Main Street and Caldwell Street in the heart of Rock Hill for $17,498. Construction on a new $125,000 sanctuary began in 1919. 1920 - The congregation held their first worship service in the newly completed sanctuary on March 21. Additions to this building were completed in 1937, 1955 and 1984. 1996 - First Baptist purchased 52 acres near I-77 on Dave Lyle Boulevard on March 3 and paid for the land in less than three years. 2003 - Nearly 1,000 people gathered at 3:00 p.m. on March 23 for a Groundbreaking Service at the new property. 2004 - The congregation held its last worship services in the Main Street Sanctuary on March 28. 2004 - The congregation worshipped in the new facility at Dave Lyle Boulevard for the first time at 10:00 a.m. on April 4 with more than 1,500 people in attendance. 2004 - On October 17 the church approved a contract to sell the downtown property to Freedom Temple Ministries and representatives of the two churches signed the contract during an October 18 press conference on the front steps of the downtown sanctuary. Closing occurred on December 22. 2006 - Following the morning worship services on November 19, the church broke ground for an addition to our Dave Lyle Boulevard facility. The addition includes a youth center, gym and church offices. 2007 - Pastor Steve Hogg celebrates his 20th Anniversary and the church opens The Rock, gym, and church offices.